With its alluring assortment of established beach destinations such as Phuket and Hua Hin, and out-of-the-way palm-fringed islands like Koh Samui, you can be guaranteed that your every need will be catered for as pampering is an art form in Thailand. Throughout the country whether you are craving barefoot luxury in the best 5 star resorts or hippy chic in a beachside hut, whether you are staying on a converted rice barge, clambering into a jungle tree house or bedding down in a hill tribe village, you will experience warm and genuine service that comes straight from the heart. If it's pulse-raising excitement combined with majestic sites you are after, head to the hectic sprawl of Bangkok's futuristic high-rise buildings and golden temples. 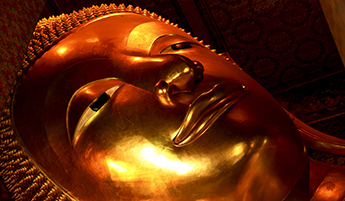 Visit the Temple of Dawn, the Grand Palace and the magnificent Wat Phra Kaew, a glistening temple that houses the country's most sacred religious image, the Emerald Buddha. Visit Bangkok's buzzing night markets and shopping malls where you are sure to find many good bargains. For those seeking to search out fascinating hill tribes and beautiful unspoilt scenery then spend some time exploring the nooks and crannies of Northern Thailand where your journey will take you to Chiang Mai and Chiang Rai provinces, home to colorful tribal groups who once migrated from southern China. Spend time discovering the remote hill villages where you can enjoy the misty mountain views, fresh mountain air and warm hospitable villagers. Generally very hot, particularly between March and May. The monsoon season runs from June to October, when the climate is still hot and humid with torrential rains. The best time for travelling is November to February, although the southern islands are best from June to September. Direct flights between London and Bangkok with a flying time of approx 12hrs with British Airways and Qantas. Passports must be valid for a minimum of 6 months from date of your departure from Thailand.